Tarot readers believe that future is volatile and it is almost impossible to predict anything just so vividly. Hence, it is better to focus on something that seems plausible and reflects on the true nature of a person. 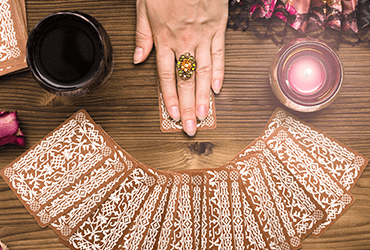 Tarot reading thus provides a precise information of the potential results that may unfold in the near future. It involves how the individual would go about things if something expected or unexpected comes up. To start the proceedings, a Tarot deck is spread over. Each position of cards in the Tarot spread represents a certain explanation regarding the possible outcome. The individual is often asked to draw a set of three cards representing the past, the present and the future respectively. A Tarot reading is performed by a clairvoyant or a psychic. A person who has a complete control over his mental faculties and can create an intuitive connection with the quintessential symbols on the card. Only he can interpret the pictures on the cards and tell what the future holds. It is often believed that the cards can speak to the reader through a divine connection. He has to take a good look at the cards and interpret them through his feelings while accounting for what’s going in the individual's mind. Question Readings: Here you are looking to find an answer to a specific question. However, psychics believe, that Tarot is not a coin which is meant to give you a ‘Yes’ or ‘No.’ Instead, it is a tour guide that shows you around and helps you decide where you want to ultimately go. Question readings help you in many ways such as - keeping your options open, narrowing down the best course of action, taking an unbiased decision, and accounting for negative outcomes. Open Readings: Open Readings are about the bigger questions that can’t be limited to a specific time frame or an event. It helps you make some crucial life choices. The key to Tarot reading is the art of deciphering what the intuitions have rolled out for an individual in the form of archetypal images, often termed as interpretation. The interpretation of a set of drawn cards may differ from reader to reader. Over the years of practice and intense study, every professional develops his own style of reading and interpreting the Tarot cards. Some Psychics are guided by the cards and some design a strategy to mould what they expect. Some may be specialized in love and career while some may be adept at finance and business. It is often believed that Tarot is a projection of conscious and subconscious mind so readers just exhibit what an individual might want to listen. There are plenty of psychic studies that credit an unbelievable degree of powers to a human mind. Tarot reading can well easily be an extension of that idea. Tarot just provides a visual cue to an individual based on his own insights of life, what materializes is just one of the many possible results that a person is already aware about in his subconscious. Do you have a question in mind? Or just want to know what the day holds for you? You can check your Free Daily, Love, Career and Finance Tarot here.